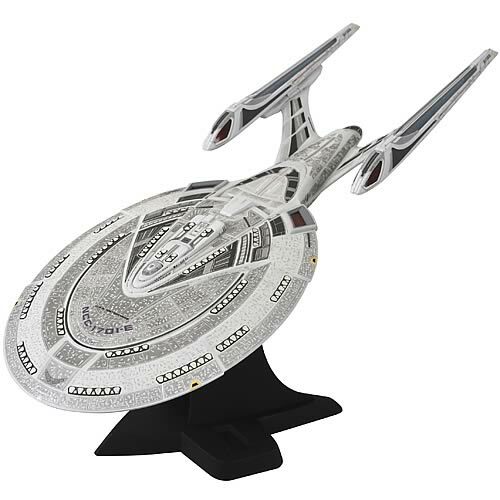 Product Detail Summary: From the Star Trek: Nemesis movie, comes the Enterprise E! Over 19-inches long, with specific markings, lights, and sounds! Features the voice of Sir Patrick Stewart. Better order this at warp speed! This awesome version of the USS Enterprise comes from the last Next Generation theatrical film, Star Trek: Nemesis. The Enterprise E features all-new paint, authentic lights and sounds, and the voice of Captain Jean-Luc Picard, Sir Patrick Stewart. The Star Trek Nemesis Enterprise E Starship comes packaged in a "Try Me" window box and measures 19 4/5-inches long x 8 1/2-inches wide. Better order this at warp speed!